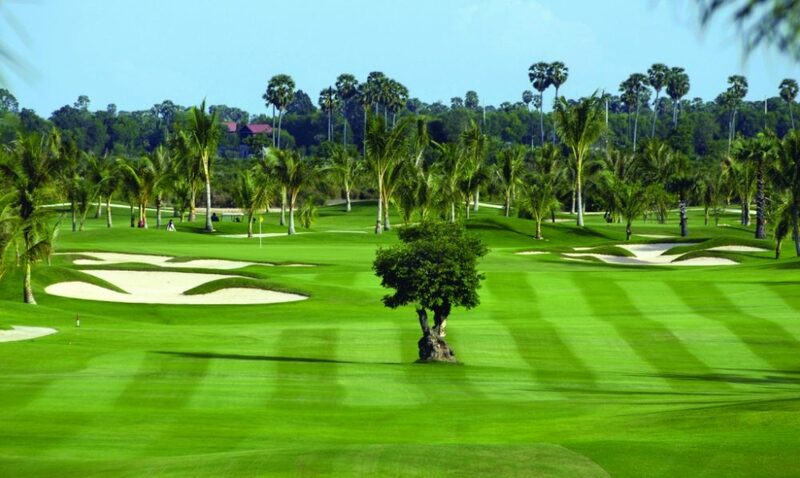 When Angkor Golf Resort opened a new level of golf course had finally arrived in Cambodia. All year round this course is presented in immaculate condition. The tees, fairways and greens are maintained to a high standard. The course measures 7,279 yards from the back tees. But don’t let the length deter you as there are a further three tee boxes on each hole. Maybe the blue course measuring at 6,666 yards is more appealing to the mid-handicap golfer. Each hole will make you think from the tee. There is an abundance of bunker and water hazards throughout the course. But thankfully these are clearly visible when negotiating a hole. A quote from the course states, “Our fairways are typically generous, but our bunkering style is impressively bold. The greens have plenty of subtle undulations and they reward and encourage a variety of approach shots”. By the time you reach the 16th hole you will be looking forward to a refreshing drink in the impressive contemporary clubhouse. But first you must negotiate the difficult final stretch. The 16th is a monster 593 yard par 5 that only the very long hitters will be reaching in two shots. Whilst the 17th is the longest par 3 on the course measuring 208 yards with water guarding the green on the right side. Finally the 18th hole, a par 4 of 437 yards requires you to skirt the water down the left hand-side of the fairway to give the best approach to the dog-leg hole. A visit to the 300 meter grass driving range prior to your round is recommended. This a great practice facility to hone your game with an abundance of target greens and a chipping area. A visit to Angkor Golf Resort is a must on a trip to Siem Reap. In fact, you’ll most probably want to play this course more than once. Phokeethra Country Club was the first true international standard golf course to open in Cambodia in 2007. Designed to a championship standard this impressive layout will test your strategic skills to the full. Water comes into play on all but one hole, plus the final hole requires the player to negotiate a double water carry. Sweeping fairways and generous greens gives Phokeethra Country Club its distinctive feel. 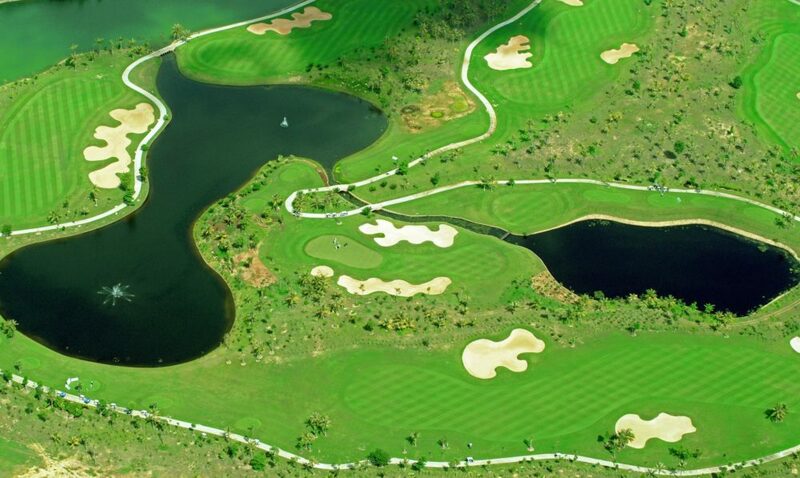 Natural lagoons and water hazards are abundant which just adds to the beauty of this 7,327 yards course. Four tees are available on each hole ensuring golfers without the ability to play a tour length layout can enjoy their game. A driving range is planned to open in the near future. There is a pitching green and putting green located close to the clubhouse allowing you to perfect your skills before your round commences. A very inviting clubhouse and restaurant awaits on completion. Whilst on the course make sure you get a view of the restored Khmer ‘Roluh’ bridge between the 9th green and 10th tee. As the club’s moto states, “Tee-off in the 11th century, finish your round in the 21st century”. 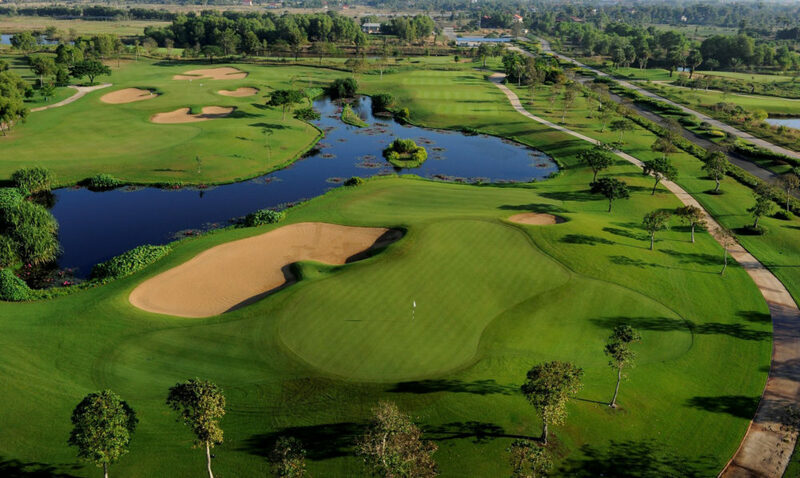 Formerly known as Angkor Lake/Siem Reap Resort Golf Club, this is the third international standard golf course to have opened close to Angkor Wat. Designed by the renowned Japanese course architect Kentaro Sato. Generous palm lined fairways, and a choice of five tees on each hole enable players of all abilities to appreciate this well presented and manicured course. Impressive saunas and an international restaurant specialising in Korean cuisine awaits you in the elaborate clubhouse upon completion of your round. Meandering creeks and an abundance of lakes comprise the main features of Siem Reap Booyoung Country Club. Plus several of the holes have split fairways making for a varied way to play each hole, either aggressive or conservative. Thankfully the fairways are inviting and flat , greens are also large, thus making a visit to the course an enjoyable and fun experience. The addition of Siem Reap Booyoung Country Club to the golf scene in Siem Reap ensured this region became a true golf destination. Highly recommend a visit.